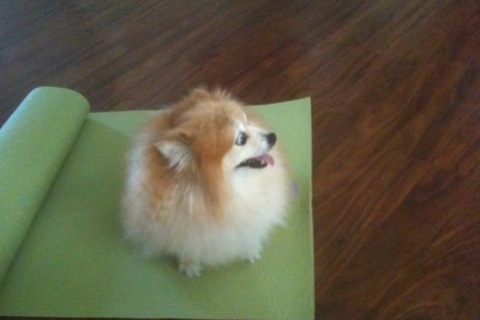 First Yoga Class - No Worries. I’m New- Which Class Is Right For Me? This is a post from Laurasana.com, Laura’s blog. This post was born out of the many questions I am asked about a first visit to a class or studio. It’s information I wish I’d had! What Should I Wear? This is easy. You can wear anything you’d wear to the gym. Shorts, sweats, etc. Make sure your shirt is fitted enough that it won’t fly up over your head if you bend over- or at least be prepared to tuck it in. Shorts should be somewhat fitted (for similar reasons), but should allow some range of motion. To be kind to your fellow students, avoid any strong perfumes or scents. Shoes: you’ll be taking them off (yep, yoga is done barefoot) when you get to class, so make sure your feet are clean. Finally, you might consider dressing in layers to accommodate any temperature changes you experience. I tend to get cool at the end of practice and it’s nice to have a long-sleeve shirt then. Do I Need To Bring Stuff? If you have a mat, you’re welcome to bring it. Otherwise, most studios (or gyms) should have mats available to borrow or rent (usually a really small fee). Some classes will utilize blankets, blocks and straps, but this isn’t something to freak out about. If the equipment is required, the teacher will have it for you there and tell you how to use it. Bring water, of course, and I always recommend a towel. What Should I Do So I Don’t Feel Stupid? Trick question!- you have no reason to feel stupid. Everyone in your yoga class was new at one point. In most classes I’ve been to, people will bend over backwards (unintentional pun!) to make you feel welcome. But here are a few tidbits for your first visit to ease any discomfort. Arrive 15 minutes early to fill out any paperwork and check out the place. Most studios will have a place to put your shoes and personal items. Find a spot in the back of the class for your first time- more experienced students in front of you can be very helpful if you get lost in cues. Don’t eat too much right before class. There’s likely to be lots of twisting and bending and… well, just don’t do it. You can eat a light snack an hour beforehand, such as a piece of fruit, some yogurt, or a small granola-bar-type-thing. Turn off your cell phone and stow it in your bag. Seriously, don’t leave it on “vibrate.” Don’t keep it by your mat. Your first time in a yoga class is a great time to practice unplugging. And I promise that when the room is super quiet and everyone’s relaxing, your phone will be the one buzzing insistently in the corner and that’s going to be a real yoga downer. Once you’re inside the practice space, observe silence, if that is the rule of the studio (and it usually is). Students come to class for quiet and relaxation. Unroll your mat and take a quiet seat. Lie down if you like, and just breathe. This will get easier with time. What Should I Expect From The Class? This is a little harder to answer. Depending on the type of yoga you’ve chosen, this can vary. Classes can range from extremely vigorous cardio-types to very gentle/relaxing. You’ll probably have an idea from the class description. However, many classes will include a beginning period of guided breathing or easy stretching; some standing postures; some seated postures, and a cool-down period that may include some guided relaxation or meditation. What Did The Teacher Just Say? Crazy Sanskrit Stuff. No need to be bilingual, but here are a few terms you may encounter. “Namaste.” Class will often begin and end with this salutation. It means, “The divine light in me recognizes the divine light in you.” The teacher will usually say it to the class and then the class says it together back to the teacher. As you say it, you can bring your hands together in “prayer” position and bow slightly. If this weirds you out, just don’t do it, nobody will care. And if they do, I would find a different class. “Drishti.”- a gazing point- where your eyes should look in postures. “Vinyasa”- translated often as “movement with breath.” This may refer to a style of yoga or to a transitional series of movements that are done as part of a class. What If I’m Uncomfortable? If in any posture you experience pain, stop what you’re doing and back out of it slowly the way that you came in. Don’t be afraid to signal to the instructor for assistance. Return to the previous posture or take child’s pose. If you’re uncomfortable with the chanting “Om” or any other mantra, don’t do it. You can also talk to the instructor afterward about either of these types of discomfort- they may have an explanation or a modification to help you be more comfortable next time. Please remember that a good teacher wants to know how they can help you. Really. Relax and Enjoy Yourself. Yoga has many physical and mental benefits. Bring your curious mind and be open to the experience.